Every summer a few million visitors come to Ibiza. Many aspire to rent a yacht in Ibiza and discover the other Balearic Island of Formentera. If you have already rented one before, you will know that for many, it’s one of the highlights of their holiday. If you haven’t yet rented a yacht in Ibiza, this article is for you. We will tell you the most successful way to rent a yacht (the generic term for sailboat or, motorboat or superyacht) and how to avoid some of the pitfalls, as well as provide a few good tips. You may simply want to day charter a motorboat in Ibiza, to sail off to the pristine sister island of Formentera. There you can swim in turquoise waters or visit one of the world’s top ten beaches and eat in a beautiful chiringuito, such as Juan y Andrea or Beso Beach. Or you can charter a yacht or motorboat for a full week’s cruising around the Balearics. Either way, this article is for you. It will make sure you have all the information needed for renting a yacht in Ibiza: from how to rent, through to the costs associated with yacht rental. By asking yourself the following questions, you should have the basic information needed to start researching your Ibiza charter. This, together with an idea of your budget, will give you a head start in finding the perfect yacht for you, your family and your friends. What type of boat would suit you best? Are you looking to experience the thrill of the ride as your motorboat leaps into action, or would you prefer to sit back and listen to the waves gently lap against the hull of your sailboat? Perhaps it is the stability, general child-friendliness or space of a catamaran that you are after. Or maybe you would prefer to take it up a notch and charter a Superyacht in Ibiza, which offer the levels of luxury and service that you might expect. Each has its own advantages and knowing which suits you and your group, will help you make a decision. How long do you want to charter for? Are you planning a day charter to Formentera to soak up the scene, or are you looking to experience a night or two’s stay aboard? Or are you planning your holiday vacation around chartering a yacht for a week or more, to get off the grid and truly discover the other side of Ibiza. The choice is yours. How many guests? If you are a party of more than 12, you may have to rent two boats, as according to Spanish (maritime) law, most vessels can only carry up to 12 when moving… Of course when you stop, the boats can tether up and you can consider using the second boat for water-skiing or wakeboarding. For overnight/sleeping aboard charters, the number of guests is regulated by licensing and determined by the number of berths available for guests and crew. Where are you staying? Where you stay may have a bearing on the marina you choose to rent a boat from. There are 3 main departure points on the island. Ibiza town has the largest selection of yachts and motorboats for hire. Interested in water sports? For those who prefer an active day on the water, some yachts have water-skiing, wakeboarding and inflatables available, or a Jetski on-board. You can also hire a Seabob underwater-scooter for the day or our Flyboard and Hoverboard experts can meet you at your boat and coach you “up” in no time. There are two main routes to renting a boat in Ibiza: through a yacht agent or broker, or directly from the yacht’s actual owner. Using an agent is usually the best way for tourists to rent, for a number of good reasons. 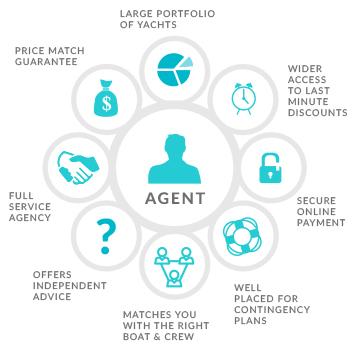 Primarily, agents have access to a large portfolio of different boats, therefore you’re more likely to get the best boat suited to your needs. Individual owners, on the other hand, can only offer you what they have available. Agents are also very knowledgeable when it comes to which operators to work with. They know the operators who are more flexible in their services; they know which are more child-friendly; and they intrinsically know which are best suited to particular groups. It is easy to assume that individual boat owners might offer better prices, however this is not necessarily true. Every summer, the best agents in Ibiza place large numbers of bookings with various operators and are therefore able to offer the same price as going direct, which means that you won’t pay more. Some agents are also able to source last minute offers on yachts in Ibiza, and these last minute deals can sometimes bring significant discounts. A great tip is to ask an agent whether they have a price match guarantee, to ensure you’re getting the best price possible. But where can these agents be found? The best resource is undoubtedly the internet, as most reputable agencies in Ibiza will have a website. You can also ask around for recommendations, as there will be many people in Ibiza who have rented a yacht before. Once you find an agent, consider speaking directly with them before you commit, as this way you’ll be able to get a better feeling for them and the way their organisation works. 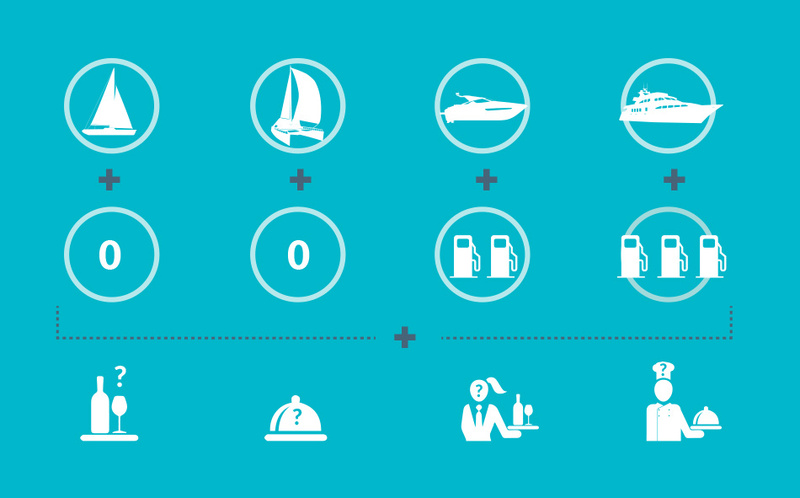 STEP 3: UNDERSTANDING THE COSTS OF RENTING A YACHT IN IBIZA? There are various costs to consider when renting a yacht in Ibiza, but understandably the biggest outlay is the rental itself. Another important consideration is fuel, which is calculated on usage. The simple rule of thumb is: the bigger the boat, the more fuel it will probably use. Any good agent will have information regarding the hourly amount of fuel used by a particular boat, and will also be able to provide estimates on how long specific trips take. For example, the return trip between Ibiza and Formentera usually takes about 1.5-2 hours. Hourly consumption multiplied by the pump price gives the approximate cost. If you are concerned about fuel prices, perhaps a catamaran or sailboat might be a good option? It’s not just what you want to rent though – it’s also about the service. While most rentals include a skipper and, depending on the boat, crew, it’s also possible to sit back and relax with a hostess or cook aboard. Costs could also increase if you sleep aboard or if you’re mooring away from the base port. Some boats can be bareboat (meaning that they are rented without a skipper), however anyone doing this will need the correct certification. Many operators include a drinks package, however these can vary. Some provide soft drinks, while others also provide beer and wine. If drinks aren’t included in a price, most agents will organise a package for you, with the prices being the same as those found in shops and supermarkets. Therefore, whether drinks are included or not, should not sway you too much. STEP 4: BOOK AHEAD OR LAST-MINUTE CHARTER IN IBIZA? Booking ahead means you’ll have a wider selection of rental yachts, and therefore you’re more likely to get the best boat for you. 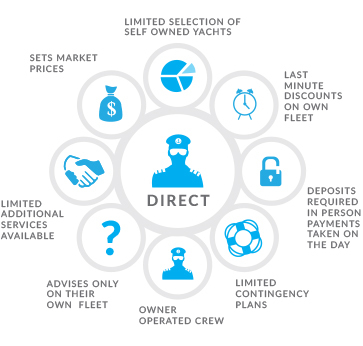 Booking early can also lead to discounts, however these are less likely when booking a yacht during peak season. Conversely, those renting a yacht at the last minute might be able to find some good discounts, but you might have to compromise slightly on choice. Booking a yacht to rent in advance or at the last minute is a simple process. You’ll be required to pay a 50% deposit when booking, with the final balance to be settled on the day the yacht is rented. For peace of mind, it’s best to book using an online payment system with a credit card, rather than over the phone, which is less secure. Paying with cash also has its drawbacks, especially if something were not to go to plan. Yacht rental in Ibiza is seasonally priced, July & August are peak months, while May & October are considered low season. Therefore the price of renting a Vanquish 43 in Ibiza, is approx €665 per day less in the first week of September, compared to last week of August. Save 32% on the Dangermouse 68 in June, €2299 vs €3388 after 01 July. Save 18% on the Sunseeker Predator 82 which is €6776 in the last week of June and first week of September vs €8228 in July/August. All rates quoted based on 2015 rates: include IVA, skipper (plus crew on 68 and 82) and drinks; exclude fuel. STEP 5: FACTORING IN THE WEATHER IN IBIZA? Ibiza enjoys some of the best weather in Europe, only experiencing on average 60 days of rain every year, mostly in March and November. Therefore, it’s unlikely that rain will hamper your experience. However, it is still prudent to know what happens should the wind whip up or the rain pour down. The most important thing to understand is this: should the weather prevent the skipper from leaving the port, alternative provisions should be made for you. This generally involves swapping the day. This is where using an agent has an advantage, as they’ll have access to a large number of boats and are therefore better placed to help with contingency plans. Also, if poor weather strikes, you won’t lose your money. Good agents and operators can usually offer refunds to those unable to change their date, however it is a good idea to check with your agent before booking. Lux Charters Ibiza is a leading yacht hire agency, working with Ibiza’s top boat owners and operators to provide holiday makers with the widest range of high-quality yachts, including superyachts, motorboats, sailboats and catamarans. We offer luxury experiences for all budgets, with the highest levels of service possible, ensuring that your charter holiday in Ibiza is one that you’ll remember forever. View the article’s infographic in full, click here.